The Chinese-appointed Panchen Lama Gyaltsen Norbu is pictured by the state media at the Zam (Chinese: Zangmu) dam in Lhokha, around 155 kilometers from Lhasa. Sept. 13, 2018 – China’s religious policies and authoritarian behavior in Tibet emerge from the Chinese government’s strategic and economic imperatives—namely securing control over borders; increasing productivity in the cities of Xi’an, Chongqing and Chengdu at the foot of the Tibetan plateau; expanding mining of the plateau’s rich resources (which include uranium, lithium and gold) in order to fuel China’s economic development; and addressing the growing scarcity of water resources in North and Northeast China with water sourced in Tibet. 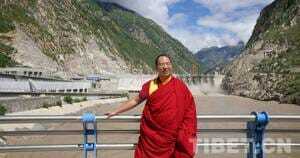 These interests converged with a photo-opportunity by the Chinese-appointed Panchen Lama Gyaltsen Norbu (Referred to by Chinese media in English as Gyalcain Norbu) at the enormous Zam (Chinese: Zangmu) Hydropower Project in Lhokha (Chinese: Shannan) during his visit there in August, which is the largest hydropower station in the Tibet Autonomous Region (TAR). The last remaining generator of the Zam dam on the Yarlung Tsangpo, the highest river in the world (which flows into India as the Brahmaputra), became operational in 2015. Despite official Chinese assurances that this dam and others would not affect the downstream area of the Yarlung Tsangpo, it has deepened tensions between China and India over capturing the hydroelectric potential of the Yarlung Tsangpo river basin. As a storehouse of freshwater and the source of the earth’s eight largest river systems, Tibet is a critical resource to the world’s 10 most densely populated nations surrounding the plateau. A major goal of China’s Five-Year Plan of 2016 to 2020 is to intensify the buildup of dams like the Zam on all of Tibet’s major rivers, with cascading dams on the wild mountain rivers and others stemming China’s last free-flowing international rivers such as the Yarlung Tsangpo, involving powerful state-owned Chinese consortiums. Zam is only the first of the planned six hydro dams capturing the water power of the Yarlung Tsangpo. Damming upstream in Tibet carries great risks, particularly as the plateau is one of the most seismically active areas of the world—but the risks are being ignored by the Chinese government. Dam designers are still surveying the TAR for locations where there is an upland lake and a river below that can be paired in a daily 24-hour pumped hydro cycle. Environmental specialist Gabriel Lafitte has noted on his blog, rukor.org, that engineers have found several such locations recently, especially in Nyingtri (Chinese: Linzhi), a heavily-militarized region that borders Arunachal Pradesh in India, and where the pace of urbanization and infrastructure construction is rapid. Scientific research shows that dams of a particular size may be a direct cause of earthquakes via a process known as reservoir-induced seismicity, meaning that the weight of water behind a dam, coupled with the seeping of water into fissures in rocks below, can produce stress strong enough to worsen, or trigger, an earthquake. A research paper by a group of Chinese scientists concluded that the weight of water clearly affected seismic activity “and it is worthwhile to further study if the effect played a role in triggering the Wenchuan earthquake”, according to an abstract of the paper published in the December issue of the Chinese journal ‘Geology and Seismology’. The plans for dam-building in Tibet have gathered pace despite the ‘model for disaster’ set by the massive Three Gorges dam, the world’s largest hydropower project and most notorious dam, on the Yangtze River and tributaries. This massive project set records for number of people displaced (more than 1.2 million), number of cities and towns flooded (13 cities, 140 towns, 1,350 villages), and length of reservoir (more than 600 kilometers). The environmental impacts of the project are likely to get worse as time goes on, and in 2011, China’s highest government body for the first time officially acknowledged the “urgent problems” of the Three Gorges Dam. Qinghai’s Acting Governor Liu Ning, whose appointment was announced in August 2018, held a senior role in the Three Gorges dam ‘Design Office’ and has a career in hydrology. He began his career as an engineer in the Yangtze River Basin Planning Office, later serving as deputy chief engineer of the Yangtze River Water Resources Commission and then as the general engineer of the Ministry of Water Resources. In 2001, Liu Ning was appointed as chief engineer of the controversial South-North Water Transfer Project, an elaborate and ambitious plan to divert water away from the upper Yangtze and into the Yellow River. This massive project, described as the most expensive infrastructure enterprise in the world, is the largest transfer of water between river basins in history, aimed at addressing China’s severe water shortage. The two working stretches of the water diversion project can divert 25 billion tons of water a year from south to north, channeling water from the Yangtze far to the parched north of China. But the project is controversial, and the current routes have cost more than twice their initial budget. Increasingly, Chinese environmentalists and experts are arguing that the project is at a dead end, as it increases pollution and does not encourage water conservation. Liu Ning’s previous positions working on both the Three Gorges Dam and the South-North Water Diversion project will likely ensure he plays a role in discussing a projected third canal crossing Tibet. This projected third canal would divert water from the Yangtze in the south to the Yellow River in the north, traversing the Tibetan prefectures of Ngaba (Chinese: Aba) and Kardze (Chinese: Ganzi) in Sichuan. But it is by no means certain that these plans will go ahead, even though the engineering team had initially been due to be switched to Tibet in 2016 at the beginning of the 13th Five-Year Plan period. It would entail an influx of Chinese workers and engineers with heavy equipment into remote valleys, as well as tunneling through mountains, with the canal itself winding around the sides of mountains. The project would likely take longer than five years and would have an irreversible and devastating impact. In Lungu County (Chinese: Wenchuan), Ngaba Tibetan Autonomous Prefecture (Chinese: Aba) in Sichuan Province (the Tibetan area of Amdo).